Local foodies and wine enthusiasts can enjoy a five course wine dinner at The Gables at Chadds Ford on Friday, March 2nd. Warm up with wine at The Gables at Chadds Ford’s winter wine dinner! The historic barn and charming restaurant is hosting a wine dinner on Friday, March 2nd. Guests are encouraged to arrive around 6:30 to mingle with other guests as the dinner will begin at approximately 7:15. The cost is $80 per person, all inclusive. Your charming emcee for the evening will be Hudson Austin of the Wine Merchant who will guide you through the five course culinary excursion not to be missed! Chilled seared duck breast served over baby spinach tossed with red onions, English cucumber, goat cheese, honey sea salt pecans, and dried figs drizzled with red and gold beet vinaigrettes. Call into the Gables (610-388-7700) and be sure to tell the host/hostess that you are coming in for the wine dinner, specifically. The Gables at Chadds Ford is located at 423 Baltimore Pike in Chadds Ford, PA. Visit their website: thegablesatchaddsford.com. 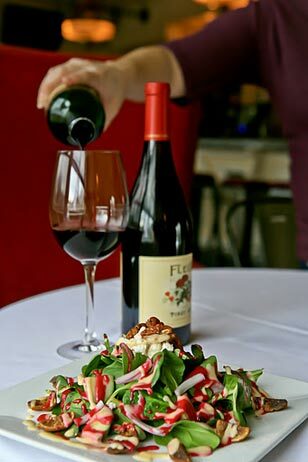 To make reservations for the March 2nd Wine Dinner call 610-388-7700. « Buzz: The Radnor Hotel’s February 25th Bridal Event!